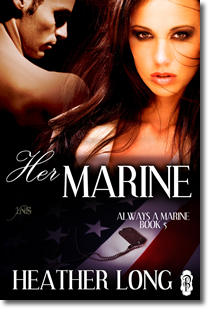 The fifth installment in the Always a Marine anthology in 1Night Stand (1NS) line for Decadent Publishing. 1Night Stand is the business name of an exclusive online dating service run by Madame Evangeline who provides her clients with a possibility of happily ever after or happily for now. Shannon Fabray is a sculpture artist and her love of the pure masculine body is demonstrated in every work of aesthetic art she creates. But her passion for the body doesn’t extend into her personal life after a hellish experience in college left her with nowhere to turn but her work. After several criticisms about the lack of passion in her sculptures, Shannon is determined to face her fears and take desire by the balls. A one-night stand should do the trick. The woman’s voice perfumed the lyrics with forbidden promises. Servers in unrelieved black slipped in and around the tables, delivering drinks and food without disturbing the spell woven on the stage. The woman’s sultry Italian didn’t detract from the emotion. Captivated, Brody stared as she massaged emotion from the music. His heart thudded a quiet counterpoint. Everything in the room hushed, from the whispers at the tables to the movement of the wait staff. When a man strolled out to meet the woman, she turned and caught his hand. He took up the song and it transformed from something provocative to a note that squeezed around his heart. An echo of movement next to him tugged his gaze from the stage. A pixie took her place next to him. Her short black curls pinned carefully to frame her porcelain skin. “They are singing about goodbye,” she murmured, her voice almost too low to be heard over the voices twining together, lovers dancing around the notes of the man’s baritone and the woman’s husky alto. “I don’t know the words,” he followed her lead, loathe to break the spell spinning between the two. Somewhere on the stage, dancers moved, but they were so understated, he didn’t doubt the crowd wasn’t quite aware of them. Oddly, tears pricked the back of his eyes at the sweet little catch the pixie woman’s voice. Pulling his gaze from the performers, he canted his head. Moisture glittered around the woman’s impossibly long eyelashes, but she watched the singers, one hand toying with a coin hanging by a silver chain around her neck.